Insurers are coming under growing political, regulatory and public pressure to support a rapid worldwide phase-out of coal. 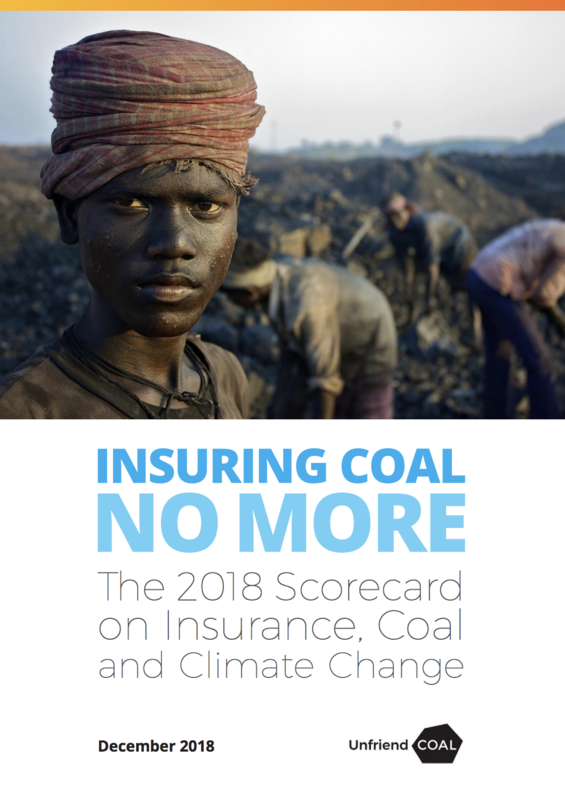 In the last year, insurance companies have taken unprecedented action against the coal industry, ending insurance for coal companies, mines and power plants and excluding coal from more than $6 trillion of investments, reveals the Unfriend Coal campaign’s second annual scorecard on the industry. But the report also reveals that insurers in the United States, Japan and Australia are still supporting an industry that is fueling dangerous climate change. The full Insurance Scorecard on Coal and Climate Change is available for free download. 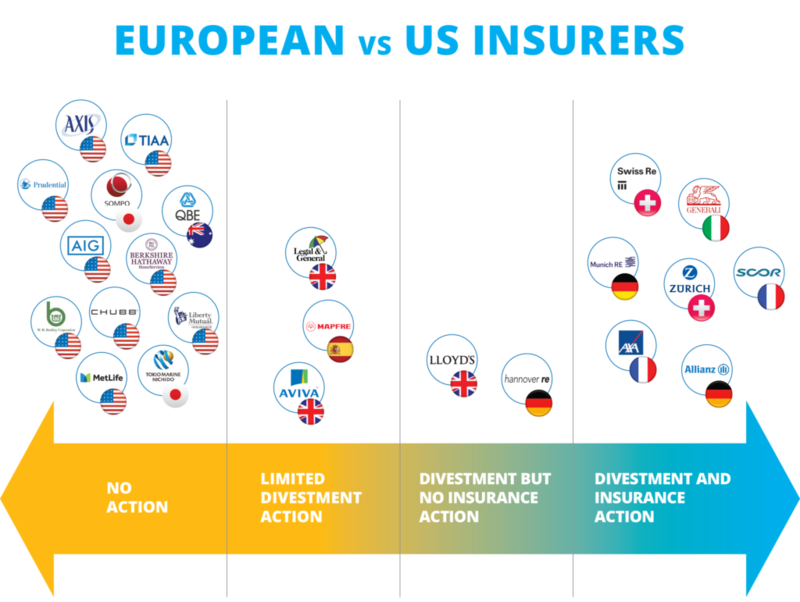 The scorecard ranks 24 of the world’s biggest insurers on their action on coal and climate change, assessing and scoring their policies on underwriting, divestment and other aspects of climate leadership. 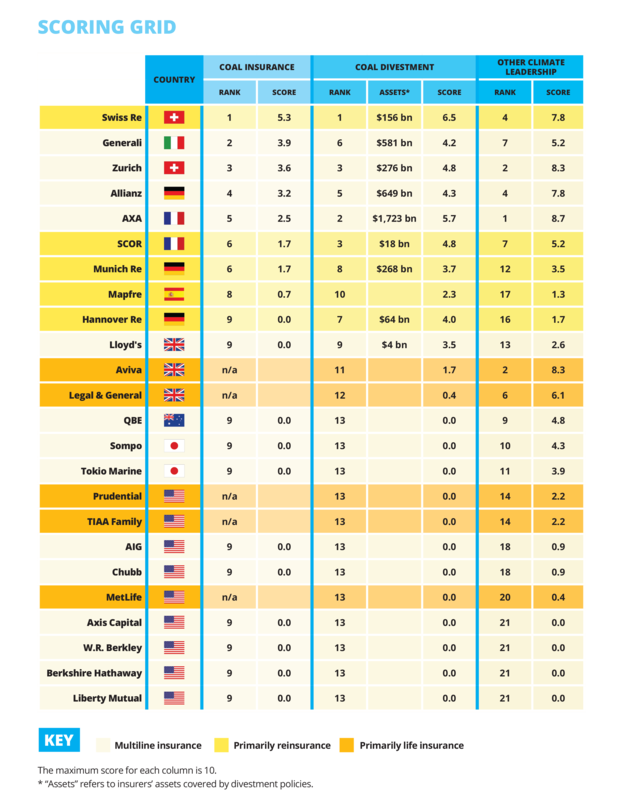 It is based on responses to a questionnaire from 18 companies, including all European and Asia-Pacific insurers, and on publicly available information (click here for the detailed methodology used in the report and here for the sources used). Europe’s four biggest primary insurers have now restricted insurance for coal. Allianz and Generali limited underwriting and AXA tightened its policy this year, while Zurich announced restrictions in November 2017. One third of the reinsurance market has now restricted cover for coal. Reinsurance giants Swiss Re and Munich Re announced underwriting restrictions this year, going beyond those already announced by SCOR. At least 19 major insurers with more than $6 trillion in assets, 20% of the industry’s global assets, have divested from coal, up from $4 trillion and 13% a year ago. Generali, Lloyd’s, Hannover Re, AG2R La Mondiale and Groupama announced new divestment policies this year while AXA, Allianz and Munich Re strengthened their policies. In the United States, by contrast, none of the nine leading insurers assessed have taken action on coal. Companies like AIG, Chubb, Liberty Mutual and Berkshire Hathaway continue to underwrite and invest in the industry. Asia-Pacific insurers also continue to insure and invest in coal, although there are some initial signs of change. Three of Japan’s largest life insurance companies, Nippon, Dai-ichi and Meiji Life, have announced they will no longer fund new coal projects. Australia’s QBE is currently reviewing its coal underwriting and investment policies. Please fill up the form below to download the report. UnfriendCoal will use the information you provide on this form to provide campaign updates. By submitting this form, you are accepting to receive emails from us. You can change your mind at any time by clicking the unsubscribe link in the footer of any email you receive from us, or by contacting us at peter@sunriseproject.org.au. We will treat your information with respect. For more information about our privacy practices please visit our Privacy page. By clicking below, you agree that we may process your information in accordance with these terms.